Premium saddle leather, double-stitched seams and hand-molded fit combine to create a pistol holster of exceptional quality. The Galco Combat Master pistol holster has an open muzzle and fits belts up to 1.75". Break in was easy. Set gun in a ziplock bag overnight and its all good. Holster fits tight to the body and the cant is perfect. This holster fits my 1911 quite well. The only problem is, I ordered it in black, and the black die is rubbing off and staining the surfaces of my 1911. I tried oiling the inside a bit to seal up the rawhide. I won't know the results for a while. A little tight. Think it'll be fine when fully broken in but right now the draw angle is limited. You have to be right on or the gun will hang up. Good quality. Perfect fit right out of the box. Large belt slots let the gun shift slightly for sitting or standing. This is my second Galco Combat Master holster. Good quality, perfect fit, no break-in. I like it and will probably buy another one. Very well made, everything I was looking for. 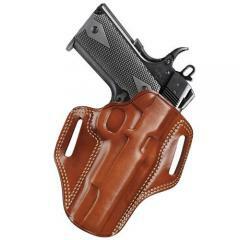 I love this holster I carry a S&W 5906 in this holster. It is a heavy gun, but this holster makes it a comfortable fit all day long. I will soon purchase another for my Glock 19. Great buy. Galco has declined in quality since I first purchased their products. First holster was sized large, returned to CopsPlus and they promptly replaced. Replacement not quite as bad but not as tight fitting as it should be. CopsPlus is a quality vendor that responds to customer problems and this holster is not their fault. I give them five stars but was over generous giving the Galco product three stars. A comfortable, good looking, and highly functional holster for concealed carry. Well made, pistol fits into holster well. Bought 1 for my S&W 19, love it. Gonna get another for my M&P. It is great, exactly what I expected and more. A well made leather holster. Top notch craftsmanship. My handgun fits perfectly. Exactly what you would expect from Galco. I have a taurus pt1911 5" dont see that option on the list. And I know even though it doesnt have it on the list something else might be similiar. What gun on the list is close enough so my gun would fit?